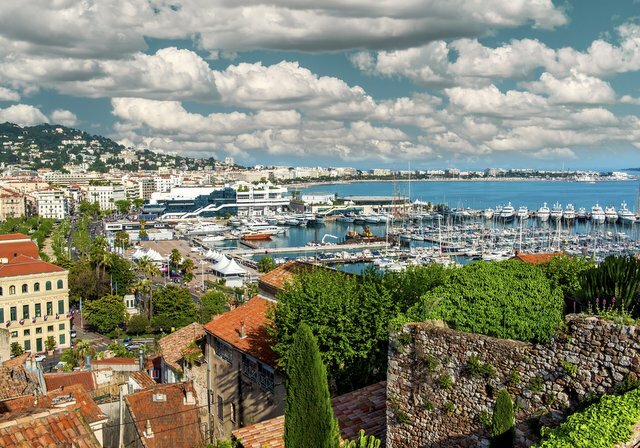 Cannes is one of the most beautiful and elite destinations along the French Riviera, and what better way to get there than by private jet? Arrive with glamour and style at Cannes airport and prepare for the picturesque extravagance that awaits you. Cannes is situated on the beautiful French Riviera, in the Alpes Maritimes department. The city and surrounding area is a top choice vacation and also plays host to the annual Cannes Film Festival, attracting numerous famous faces. Cannes has created an unparalleled lifestyle, with continual reinvention to offer modern luxuries to its crème de la crème of clientele. The compact centre is home to the most famous French and international brands, you will find names such as Bulgari, Cartier, Chanel, Lacroix, Jean-Paul Gaultier and Hermes, to name a few. Find this array of indulgence situated between Rue d’Antibes and La Croissette. If these names don’t appeal, and you are searching for some holiday garments, you will find shops such as Zara down the long main street. Rue Hoche also provides a little more of a high street approach. The real Cannes shopping highlight though must be the Forville Market, located at the Place du Marché Forville. Every morning there is an eclectic market, with deep, rich coloured fruits and vegetables lining the stalls. You will be tempted by the syrupy scent that mingles with the heady smells of the myriad of floral bouquets. This is the perfect place to prepare for a picnic! After you have collected a treasure trove of delicious food, you can take your picnic basket down the French Riviera, and find a secluded spot to enjoy your assortment of delectable treats. Unwind and gaze out across the limpid waters, as an explosion of sweet fruits wash over your taste buds. If, after your energetic exploration of Cannes, you are feeling a little peckish, take a trip to Le Mesclun; a restaurant utilising only the finest produce. It is an elegant and luxurious, yet traditional restaurant, with an innovative edge. For a starter, treat yourself to roasted sea scallops or creamy zucchini soup, each with their own unique twists. For a main, perhaps you can be tempted by champagne creamed stewed lobster with a sumptuous side of Forville Market mixed young vegetables; their produce is locally sourced. Finish off your meal with a choice from the eclectic dessert selection. As well as this absolutely gorgeous cuisine, they have an exceptional and extensive wine list, so you can pair each meal with the perfect glass of wine. Lerins Island is a group of four absolutely stunning Mediterranean islands, just off the French Riviera, near Cannes. They are accessible by a boat that takes you gliding across the crystalline waters, slipping easily through the foaming surf. These unspoiled, and vivacious islands surround you with exploding flora and fauna. The thick forestry that covers the island holds a unique history, including the tale of the Man in the Iron Mask. With this abundance of history that is situated on these four momentous islands, it is no wonder people flock to see what they can uncover. The islands themselves include sights such as Eglise Notre-Dame d’Espérance, Memorial Saint-Georges, Château Vallombrose, to name but a few. There are countless sights to explore over the four islands, so climb aboard a boat and see for yourself! If you are in the mood to experience the nightlife that Cannes has to offer, and your feet are aching for a dance, jive on down to epicentre of Cannes nightlife, located on Rue Commandant André, and the nearby streets. The area is known as the Carré d’Or (Golden Square). Experience the many restaurants, bars and clubs in the area, whilst hardly taking a step.